Who doesn’t look forward to the new Noah Baumbach? He’s Woody Allen via Jean Luc Godard, set amongst the cool-kids in New York. Director of the lovable Frances Ha and mentally-unhinged Greenberg, his latest film, While We’re Young, returns to similar themes of youth and age amongst urban city-slicker art-types. Cornelia (Naomi Watts) and Josh (Ben Stiller) are introduced as they hold a crying baby, and uncomfortably fawn over the child. It’s not their child, thank god. New Yorkers through-and-through, they are stuck between that early-forties phase whereby they’re not keen on the responsibility of parenthood. Then, they meet young and cool Jamie (Adam Driver) and Darby (Amanda Seyfried), and feel better about themselves. Josh is inspired to wear a hipster-hat and tries to ride a bike. Cornelia attends hip-hop work-out classes and they both enjoy hallucinogens while dreamily confessing their fears and desires. It’s the age-old fight against old-age – and, like the best films, it raises more questions than it answers. Nobody is perfect and this isn’t a world whereby life is fair. A personal highlight is when documentarian Josh requests to zoom-in on footage, only to be met with the stunted response that the program can’t zoom in. 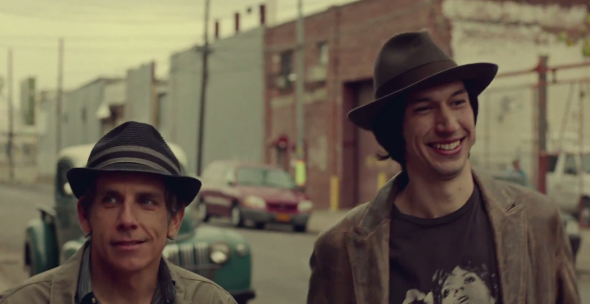 While We’re Young is the type of story that only reaffirms your own frustrations about the fragility of life, with acutely-observed comedy and self-effacing criticism. Youngsters will like the young. Oldies will relate to the older folks. But this careful balance is what makes While We’re Young so elegantly exquisite.